SAN JUAN, Puerto Rico — Iguanas of Puerto Rico: Your days are numbered. The island's government is announcing plans to kill as many of the reptiles as possible and export their meat in hopes of eradicating an imported species that has long vexed residents and entertained tourists. 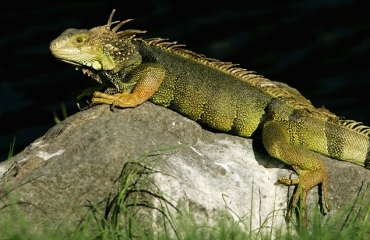 The U.S. Caribbean territory has roughly 4 million iguanas, which is a little more than the island's human population, according to Daniel Galan Kercado, secretary of the Department of Natural Resources. "This is a very big problem. We have to attack it," he said in an interview Friday. "It has impacted structures, the economy, crops and the ecosystem." Puerto Rico has long struggled to eradicate the bright green reptiles that can grow up to 6 feet (1.8 meters) long and have a life span of some 20 years. Iguanas are considered an endangered species throughout most of Latin America, but Puerto Rico is overrun with them, in part because they breed so quickly and have few natural predators. The reptiles were first seen in the wild in Puerto Rico in the 1970s when owners began to release them, and their numbers have since exploded. They have been blamed for taking over airport runways, burrowing under buildings and destroying foundations, and causing blackouts by building nests near the warmth of electric plants. Galan and other government officials, including Gov. Luis Fortuno, said killing the iguanas for export is a novel solution that economically benefits an island in its fifth year of recession. Puerto Rico's Department of Health has approved letting Galan's agency finalize a plan to train volunteers to capture live iguanas and bring them to a processing center for slaughter and distribution to the U.S.
Demand for iguana meat is high in U.S. states with large populations of Latino and Asian immigrants, said Galan, who anticipates having the plan finalized by May. It would then have to be reviewed by several government agencies before it's approved. Galan said numerous people have contacted his department to participate in the iguana roundup, although officials are still looking for a company that would help process and export the meat, which can be sold for up to $6 a pound. "That is a lot more than chicken," he said. "It has great economic potential." Fortuno said at a press conference this week that he supports the proposal.